﻿ Florida Snake Photograph 052 - The Banded Water Snake is not venomous, but it will strike. The Banded Water Snake is not venomous, but it will strike. DESCRIPTION: A thick aquatic snake with a brown, black, and rust or orange colored pattern. The belly has white and colored segments. The inside of the mouth is white. This snake is often accidentally labeled as a Cottonmouth. 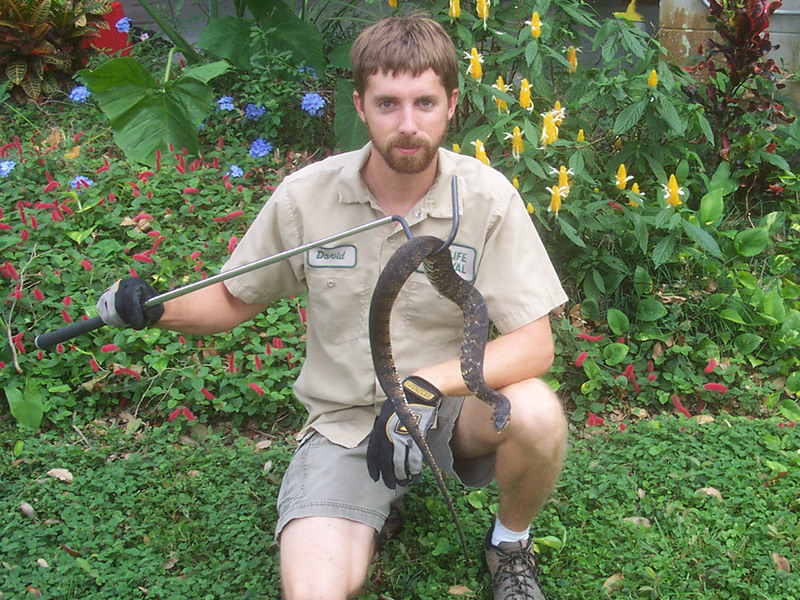 Defense Mechanisms of the Banded Water Snake - Snakes have a lot of ways to defend themselves. Normally they resort to biting, but sometimes instead of biting, depending on the species, they can utilize other ways to discourage a predator or someone invading their territory from approaching them – especially when they would rather be left alone. The banded water snake in particular, has a very unique way of fending off potential observers or predators and humans who want to pick them up. Banded water snakes are solitary creatures and often want to be left alone. If a predator tries to grab them or a human being tries to capture them, they will first try to escape. If they are unable to break away from predator or human grasp, they can become extremely temperamental and respond violently. It is not unusual for them to reach around and attempt to strike their captor. Admittedly this type of defense is common for many species of snakes, but what makes the banded water snake a little bit different is that they can also emit a foul-smelling musky odor from their cloacae which can deter their captors. Despite their edgy temperament, it is possible to keep this snake as a pet, but more difficult to calm them down if they’re caught wild as they are not used to human interaction. If they are captured wild, gentle and gradual handling should help them get over their initial nervousness. They will refrain from biting or releasing the musky odor in defense. But the key is to handle them in such a way that they calm down. You want the snake to feel at ease so that they will not continue to feel threatened. If he doesn’t feel threatened, he will not feel the need to strike out in defense.